While the future of Mega Man is unclear, that's not stopping others from looking to the blue bomber for inspiration. After a successful Kickstarter campaign, Batterystaple Games' has just pushed their tribute title, appropriately called 20XX, into beta on Steam Early Access. We spoke with Chris King, the lead programmer and designer, about making a modern Megan Man title. Co-Optimus: Thanks for taking the time to talk with us. Could you tell us a little about yourself and your background in game development? Chris King: Of course! Thanks for having me. I'm Chris King, the guy making 20XX (as the company Batterystaple Games). This is my first commercial game. I've always wanted to make games, so when I realized this might be the only time in my life (woo! late 20s) when I have some cash saved up but don't have a spouse or kids (read: people who will be mad at me/have their lives affected if I fail), I decided to just go for it. Before taking the plunge, I studied comp sci as an undergrad, then worked as a programmer for a telecom services company and a cybersecurity company. Co-Optimus: Your first title, 20XX, is an action platformer with nods to the Mega Man X series of games. How did you get started on something like this? Chris: Like our players, I really just wanted more Mega Man, and figured maybe I could make something that scratched that itch. If Capcom had kept me on a slow drip of MMX titles, I probably wouldn't've made 20XX at all. 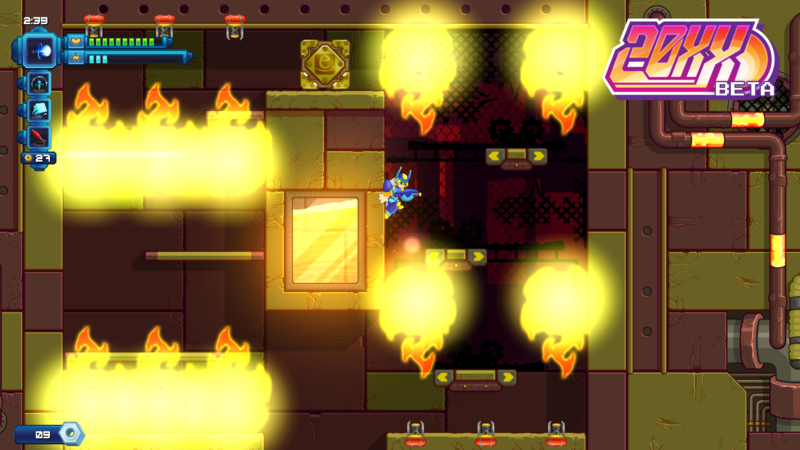 Co-Optimus: So will players who have played any Mega Man game feel right at home? Are their boss robots with appropriately themed stages and, upon beating said boss, will you get a new weapon based upon that boss? Chris: Yup! Exactly. We've taken a few liberties with the formula – first, the roguelike/lite elements – dying sends you back to the lobby (to start with a freshly generated set of levels), and there are tons of new passives to unlock as you die and replay. Instead of collecting an arsenal of powers (one per boss), each time you beat a boss you get to choose between taking his power, a random stat upgrade, or some cash. Which you take will depend on what levels are ahead of you (do you need this as a boss weakness? ), how much you like the item in general, how good the stat item is, and so on. You also only have three power slots, and they're all mapped at once, so no cycling through weapons! Use them freely. The game currently has four distinct themes for its eight bosses, so in each run you'll see each theme twice (albeit generated differently and at different difficulty levels). Definitely a shortcoming of a small team/budget – we would have loved to have each boss have an entirely unique theme. Co-Optimus: How does that procedural generation work? Are the random power-ups things like weapon power boosts and new abilities, or something else? Chris: Each level is made up of a bunch of level pieces (“chunks”) woven together in a way that makes them flow seamlessly. 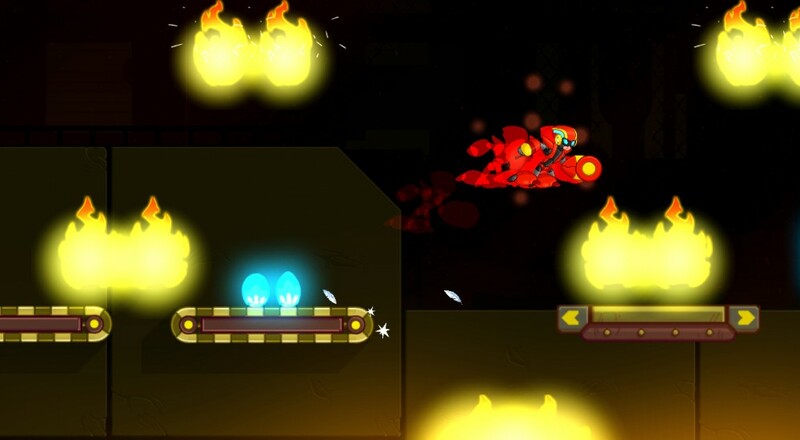 A chunk is a loosely defined piece of a level – it states how big the piece is and where some of the platforms will go, but is then filled out at level generation time by a whole bunch of different platforming challenges, enemies, and hazards, based on where in the game the chunk is encountered, where in the level this chunk is placed (the later in the game or level, the harder it'll be), and the whims of RNGesus. The powerups come in a few forms. There are passive upgrades, which apply to your character (or team) for the rest of the run – think like Binding of Isaac. These can be direct stat upgrades (speed, damage, health), new abilities (air dash, double jump, shot-erasing, etc), or triggered effects (gain health when collecting money, release a damaging shockwave when you take damage, that sort of thing). There are primary weapon upgrades, which change your basic weapon for the rest of the run. Nina's buster arm can be swapped out for weapons like the Wave Beam, changing her attack into a wall-piercing purple orb, or the Scatterblast, changing her attack into a short-range burst of particles. Ace's beam saber can turn into a bunch of other melee weapons, like the Spinning Glaive, which lets Ace spin-attack while in midair, or like the Rippling Axe, which covers a wide arc and does tremendous damage – but is very slow. Finally, there are the boss powers mentioned above. Each time you beat a boss, you get to take his power, a random stat upgrade, or some nuts to (hopefully) spend on health, energy, or bonus passives later on if you can find a shop. Page created in 0.9012 seconds.